As part of the annual Canadian UFO Survey, I usually go through all the government and official sources for UFO reports. But since there are relatively few such cases reported through official channels every year, I don't look at the sites very often. As it was, I had a few people alert me to a CADORS report that was getting some media attention because a reporter had heard about it. 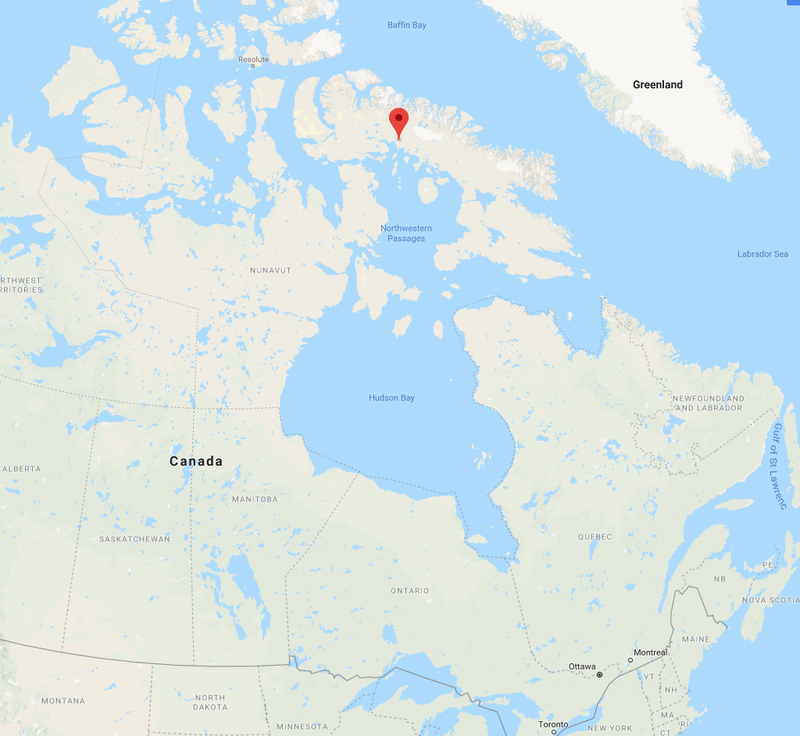 A story about the case was published in the Nunatsiaq News on November 27, 2018: Pilots report UFO sighting over Nunavut’s northern Baffin Island. 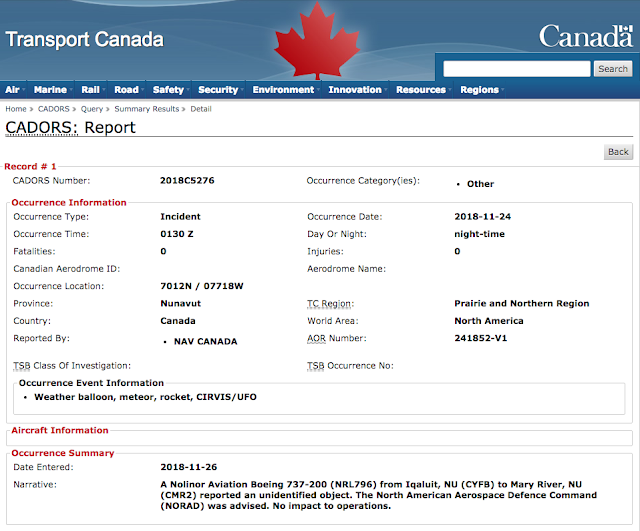 The news report referred to a CADORS report (Civil Aviation Daily Occurrence Report System report), which is a mandatory notice Transport Canada requires pilots to file if there is a problem with their flight. This can range from unruly passengers, smoke in the cockpit, malfunctioning transponders, to unauthorized persons or vehicles on a runway. One of the CADORS categories is "Weather balloon, rocket. meteor, CIRVIS/UFO." CIRVIS reports are Communications Instructions for Reporting Vital Intelligence Sightings. The purpose of CIRVIS is to provide standardized reporting procedures when something unusual is sighted by military personnel or civilians, that might be of vital importance to the national security of Canada or the United States.Reports are filed under Joint Army Navy Air Publication-146 or JANAP-146. (a) Hostile or unidentified single aircraft or formations of aircraft which appear to be directed against the United States or Canada or their forces. (b) Missiles(c) Unidentified Flying Objects(d) Hostile or unidentified submarines(e) Hostile or unidentified group or groups of military surface vessels(f) Individual surface vessels, submarines, or aircraft of unconventional design, or engaged in suspicious activity or observed in a location or in a course which may be interpreted as constituting a threat to the United States, Canada, or their forces. (g) Any unexplained or unusual activity which may indicate a possible attack against or through Canada or the United States, including the presence of any unidentified or other suspicious ground parties in the Polar Region or other remote or sparsely populated areas. Anyway, the pilot of an aircraft flying over Baffin Island in the Canadian Arctic saw an odd light, and dutifully reported it. The aircraft, owned by Nolinor Aviation, was a Boeing 737-200 going from from Iqaluit (the capital of Nunavut) to an open pit mine known as the Mary River Mine, about 1,000 km to the northwest. This occurred on November 23, 2018 (most sources give the date incorrectly as November 24 at 130Z) at 1930 local time. This resulted in a series of posts and commentary by several UFO fans, including the editor of the popular UFO blog Mysterious Universe, who sensationalized it a bit. Why would a UFO be interested in an iron mine? UFOs are often seen over mining operations. From 2010 to 2015, UFOs were reported over a number of copper mines in Chile. Speculation ranged from drones or helicopters spying on the mines to aliens coming in for parts or fuel. Marco Prud’homme, Nolinor’s vice president, says the pilot told him he saw a shining light, which changed from red to green to white, and it could have been a star, a meteorite, or “probably something natural.” Of course that’s what he’s going to tell the management – he wants to keep his job. While all the excitement was raging among UFO fans, I thought I'd try something practically unheard of in UFO circles: investigating. I contacted the airline and spoke with Prud'homme, who basically reaffirmed the news story. The only other detail he had from the pilot was that the light he had seen was stationary. Mars was bobbing along the southwest horizon, so if the pilot was looking to his left, it would have been visible, and scintillating because of the atmosphere. And it would have been changing colours. I asked Prud'homme to contact the pilot and get a few more details. Like: what direction was he looking? how long was it in sight? how high was the light in the sky? The answers would help nail down what exactly was seen. Prud'homme assured me he would have the pilot answer these additional questions and then get back to me. Before anyone gets too excited about this case, and assume aliens want our iron ore, it's worth some simple rumination and investigation. It’s easy to disbelieve rock stars or people who can’t seem to tell the difference between a star and a UFO. That’s why we need to keep an open mind when these reports come from pilots and astronauts. Especially around the mysterious Baffin Island. The reality is that pilots are seeing stars and planets and reporting them as UFOs all the time. The National Archives is chock full of such cases. I should know; I've looked at thousands of them. But yes, let's keep an open mind. But not so open that your brains fall out. 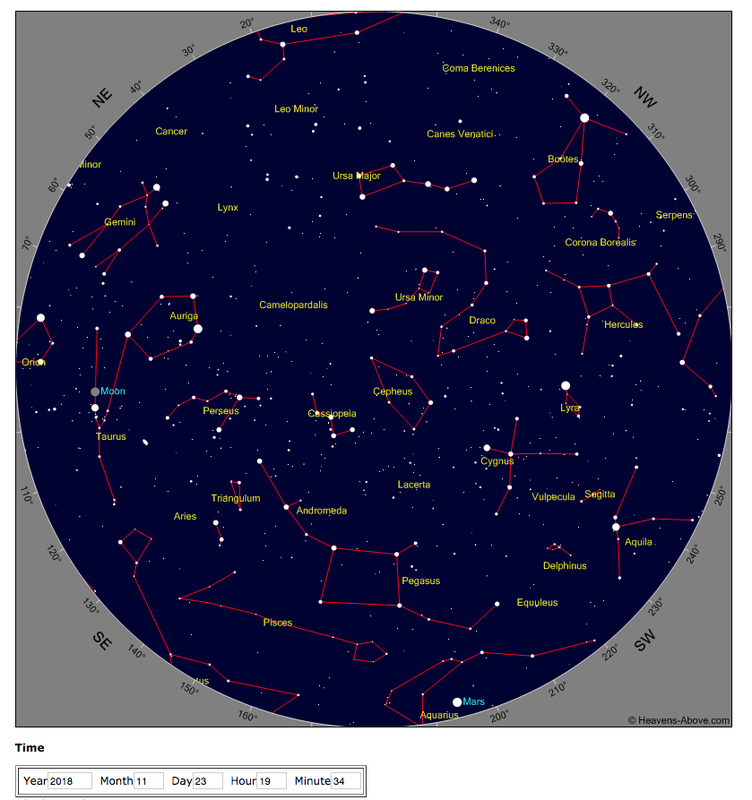 We have done our own research and what our pilot saw low on the north east sky was the star Capella.I was able to see it also myself this week and it does look like a strange plane when you are at 40,000 feet in the sky since it’s so low on the horizon.It has been reported also by other pilots internally last week. That actually helped fill in some of the information that was lacking to help explain the sighting by the pilot. We had not known that the object had been seen in the NE, low on the horizon. And certainly, Capella, known as Alpha Aurigae, was indeed in the NE sky at about a bearing of 70 degrees. It's the sixth-brightest star in the sky, and if often the culprit when UFOs are seen. Sorry for all the buzz.